VIDEO: Cosmonauts Slice Spacecraft For Clues To Cause Of Mysterious Hole A small hole in spacecraft Soyuz MS-09 has sparked an investigation into its origin. 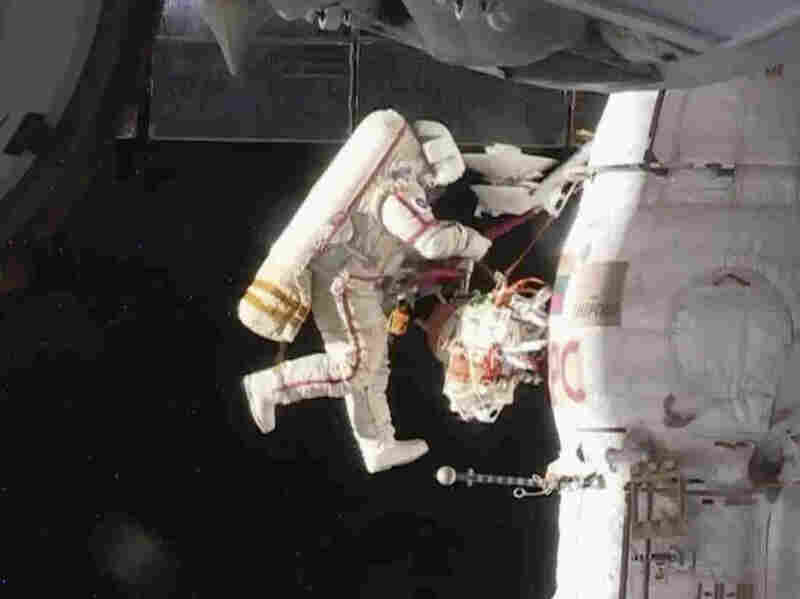 Cosmonauts spent hours on a spacewalk to gather samples in hopes of determining its cause. Russian cosmonaut Oleg Kononenko performs a spacewalk outside the International Space Station on Tuesday. Kononenko and Sergey Prokopyev are inspecting a section where a mysterious leak appeared on Aug. 30. "Honestly I can't look at that," cosmonaut Sergey Prokopyev says, as voiced by a translator, while fellow cosmonaut Oleg Kononenko slices into the side of the Soyuz MS-09 capsule. "It's my vehicle, Oleg!" "The cosmonauts spent hours using knives and what looked like garden shears to cut away at the insulation around the spacecraft's orbital module, to peek at the damaged area," NPR's Geoff Brumfiel reported. "All along, mission control in Moscow pleaded with them to take it slow so they wouldn't make the situation worse." The crew slowed the leak with a piece of Kapton silicone tape, and later patched the hole with gauze and epoxy. But the question remained: What caused the hole in the first place? Investigators quickly dismissed theories of meteorite impacts, as the hole seemed to come from inside the capsule, said Dmitry Rogozin, the head of Russia's space agency Roscosmos, according to state news agency TASS. Adding to the mystery, the hole looked like it came from a drill. As NPR reported in September, Russian officials believe the leak "was likely caused by a human hand." "We are considering all the theories," Rogozin said, according to TASS. "It is a matter of honor," he continued, "to find out whether it was an accidental defect or a deliberate spoilage." "In what is perhaps another first for the Russian space program, a cosmonaut has just unsheathed a large knife and stabbed his spacecraft," wrote Moscow-based space journalist Matthew Bodner on Twitter. Eventually, the cosmonauts found the location of the sealed hole and took samples of the epoxy, which will be brought to Earth for analysis, according to Space.com. George Washington University space policy expert John Logsdon told NPR in September that there is "a kind of generalized concern about the decline of quality control in Russian space industry in recent years."